Last Friday morning I had a doctor appointment in Oakland. It was not a pleasant or efficient experience. We were there 15 minutes early but I didn't get called back until 40 minutes past my appointment time. After that exam, I was sent off to another area for a test/exam. Another 25 minute wait. Two machines and two women later (and a lot of discomfort) there was still not a successful result so I got angry because the last time this was done there was no problem. So I told them I refused to try again. Back to the waiting room. Another 20 minute wait until someone asked if I was waiting for the next test/exam and I said yes. It was still going to be 20+ minutes before that one. At this point, we had been at the hospital for 3 hours. It was well past lunch, we were really hungry, and I was in a foul mood. So I asked for my 2 exam/test prescriptions back and said I'd make arrangements to get them done elsewhere. We left and went to get lunch. (Note: I did not have the 2 tests scheduled, just the initial exam, but my doctor wanted me to have them done so of course they shuttled me off; had I known how much time would be spent waiting and waiting and waiting I never would have agreed to have the tests done, I would have just scheduled them myself for another time). 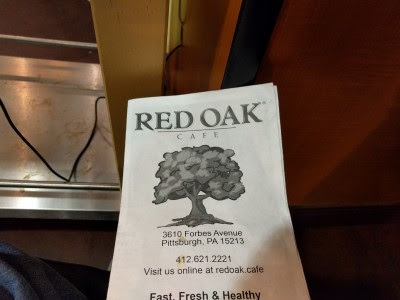 We walked to Red Oak Cafe, a place we've driven/walked past many times but we've never eaten there. It's a cute cafe. It was crowded. You order at the counter, they give you a number, you find a table and place your number on your table, and they bring your food to you. They serve breakfast all day and I love breakfast sandwiches so I was happy. Nothing like some bacon to improve your mood. SP chose Galileo (egg, bacon, provolone, seared tomato, wheat toast) - pictured above. He said it was yummy. 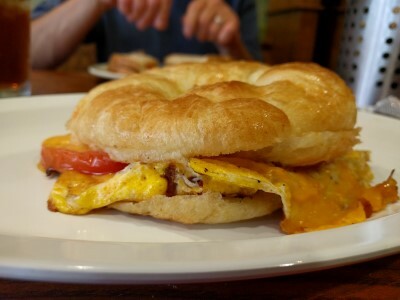 I created my own breakfast sandwich: egg, cheddar, bacon, tomato on croissant. It was tasty. It was a good size for me, almost more than I could eat. I think SP was a little sad I didn't share! 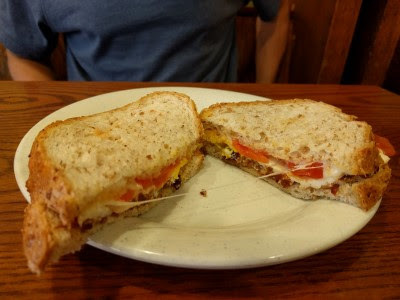 They also serve egg scramblers, breakfast burritos, pancakes, salads, sandwiches, smoothies and have a lot of vegetarian options that can also be made vegan options. A plus: fresh brewed iced tea. Definitely a nice, casual, not too expensive cafe in Oakland worth stopping by and grabbing a bite. The person who took our order was very friendly and helpful. It's in Oakland so I imagine it's super busy in the fall/spring when there are a lot more students on campus.